Altieri Sebor Wieber는 새로운 디자인이 필요한 엔지니어 회사였습니다. 직원들의 성격은 굉장히 보수적이고 직설적이었습니다. 엔지니어였기 때문에 디자인에 대한 관심이 적었습니다. 소통이 원활하지 않았지만 그들의 성격과 스타일을 알아내서 디자인에 적용하려고 노력했습니다. 프로젝트가 많아서 몇몇 대표적인 프로젝트들만 웹사이트에 올리기로 했습니다. 사용자가 더욱 편리하게 볼 수 있도록 “리스트로 보기”와 “이미지로 보기”라는 옵션을 만들었습니다. “이미지로 보기” 페이지에서는 마우스를 한 프로젝트에 올려놓았을 때 나머지 프로젝트들이 80% 남색으로 바뀌게 하여서 어떤 프로젝트에 마우스를 올려놓은 것인지 비주얼적으로 더 흥미롭고 확실하게 디자인하였습니다. 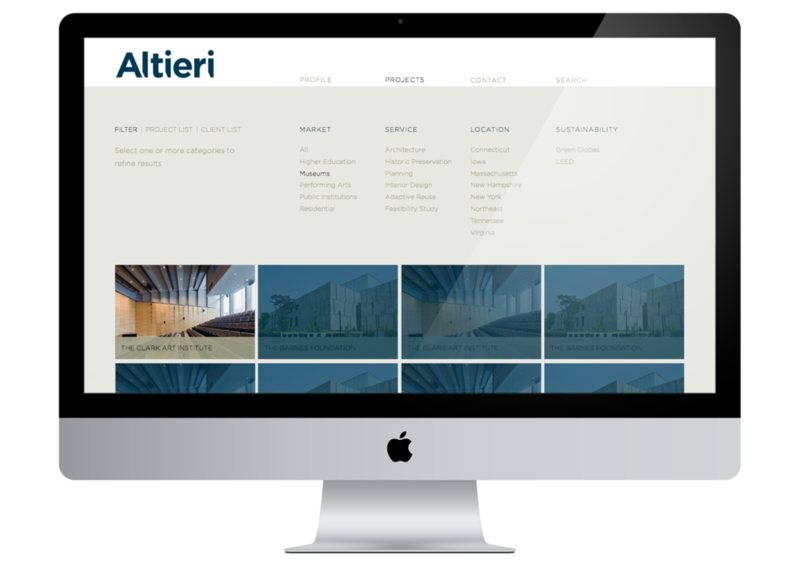 ALTIERI SEBOR WIEBER IS AN ENGINEER FIRM THAT needs a newly designed website. People at the firm are very conservative and straightforward. They are engineers so thatthey did care too much about design. Even though communicating with them was very poor, I tried to pull some characteristics and styles from them and applied to the design. 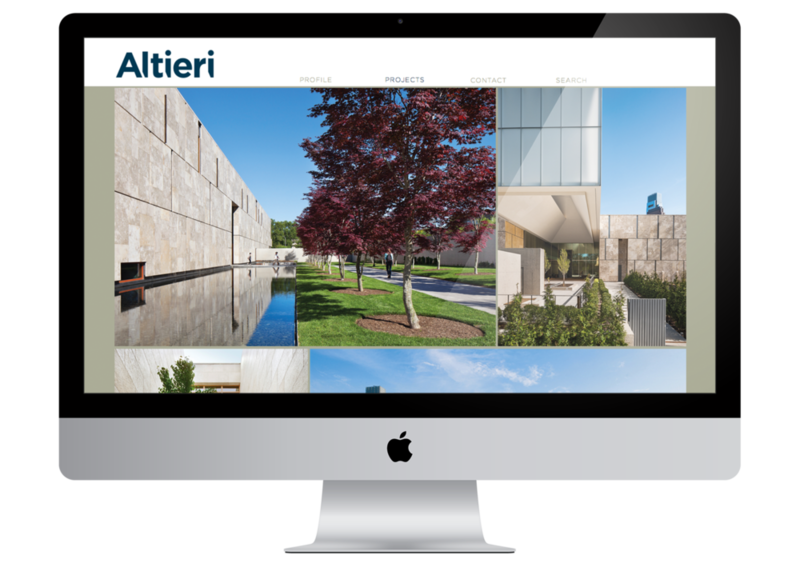 They had so many projects that we trimmed down to several signature projects to show on the website. Some users may want to see the whole project list at once so I made two options, “List View” and “Image View” which allows users to choose. On the “Image View” page, I reversed the hover state. Instead of having the hover on the one you have your mouse on, I made every other projects to have the hover. San-Serif인 Gotham과 Whitney만 사용함으로써 전체적인 디자인의 느낌은 진지함과 자신감을 강조하였습니다. 간단함과 지루함을 피하고자 각 페이지의 배경을 다른 색이지만 같은 톤으로 바꾸었습니다. 하지만 일관성을 잃지 않기 위해 심한 변화는 자제했습니다. BY USING ONLY SAN-SERIF FONTS, Gotham and Whitney, the overall look and feel of design emphsizes seriousness and confidence. To avoid being too simple and boring, the background color of each section changes subtly, but not too dramatically to feel consistent.